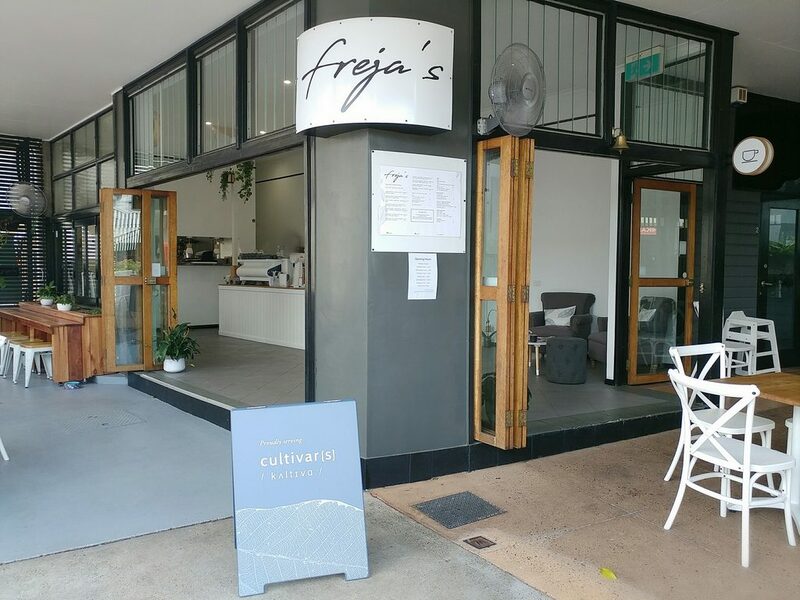 Freja’s Cafe is a newish addition to the enclave of shops in Wilston Village. Our interest was particularly piqued by pictures of their food and word that they flew their croissant dough in from France. A catch up with friends where the request was specifically “somewhere new” proved the perfect opportunity to visit. 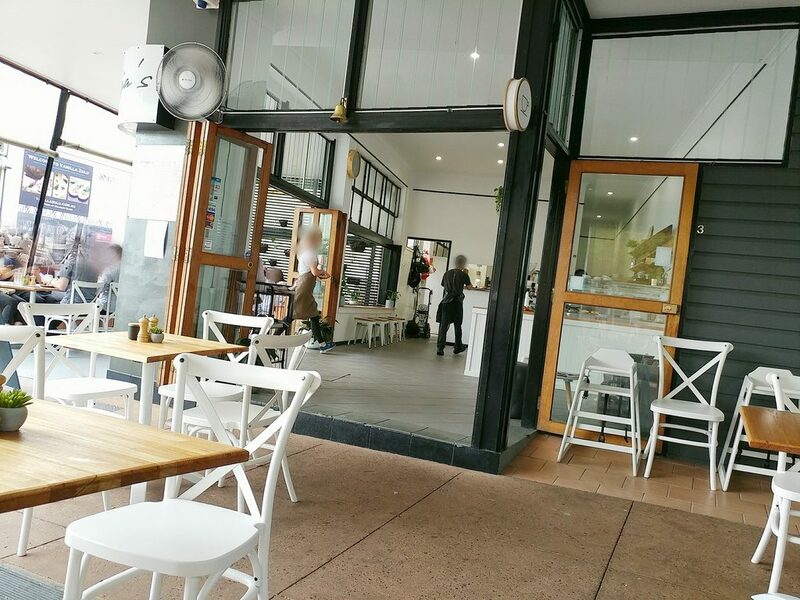 We found it just off the main shopping strip of Wilston Village, across from the Alcove Cafe and Deli. Google Maps navigation helped, as its muted shades and understated sign didn’t jump out at us. The vibe is certainly more sophisticated classic than neon exuberance. 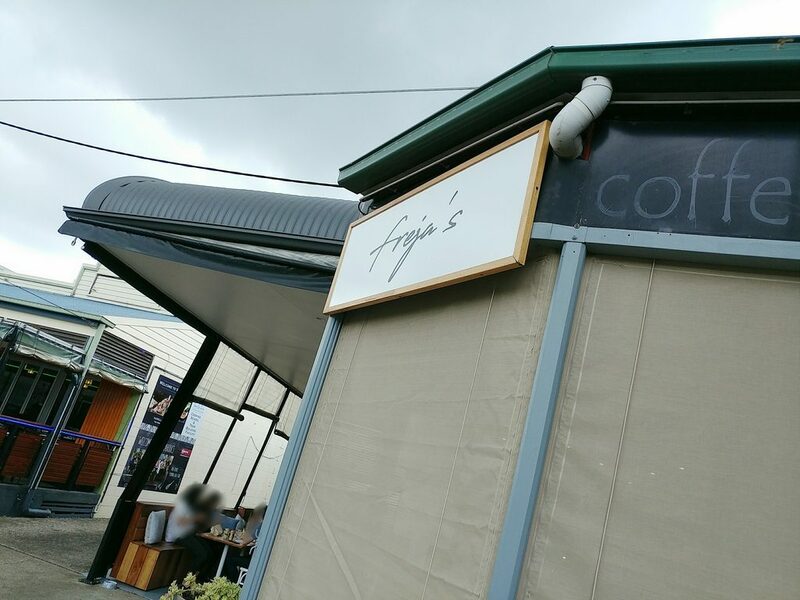 What we saw of Freja’s Cafe from across the road. The kitchen and service area take up the actual enclosed part of the eatery, with seating in sheltered outdoor areas to the front and side. Nordic shades of charcoal grey, warm wood, and white make up the main colour palette, giving it a modern, urbane look. The clean white walls inside and the white crossback chairs outside brighten the space, while the wooden door frames and tabletops keep it from looking cold and clinical. Deep grey outside walls and window frames add some grounding contrast. There were little pots of succulents at most of the tables, for a touch of nature. A look at the seating area of Freja’s Cafe. A glass bottle of cold water, glasses, and menus had been brought out for the first of our party to arrive. The menu was simple black on white, a single sheet in placemat format. 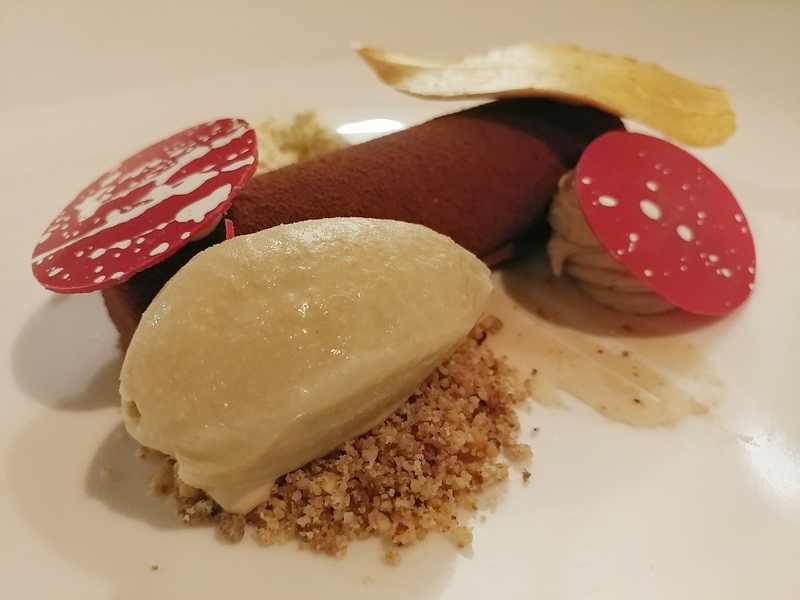 Rather than named or described dishes, there were lines of component ingredients, similar to what you would see at a high end restaurant. There were a number of intriguing options, with each of us torn between at least a couple of items. In the end, we decided to get a few dishes and share them. More of the cafe from another angle. Patrons have to go to the service counter to order and pay. As we did, we were further tempted by the pastries on display in the glass cabinet and out on the counter. A clever ploy.. Some of the baked goods you can buy. 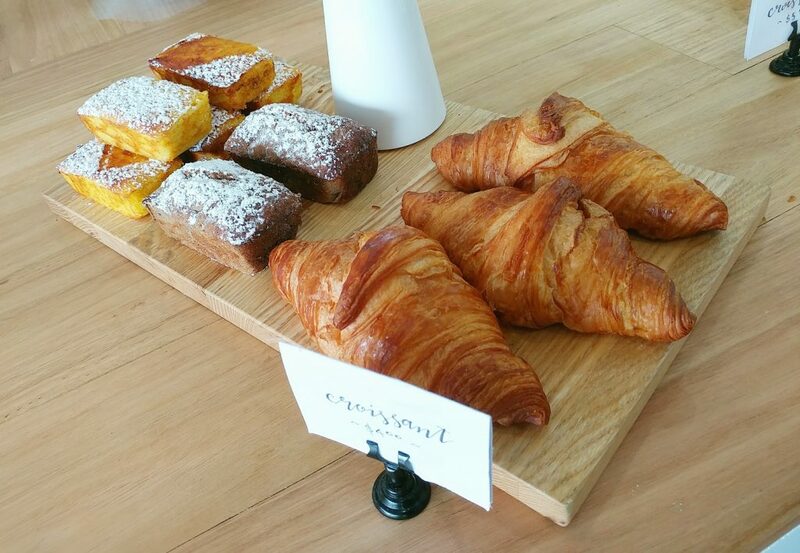 The croissants are made with dough flown in from France. 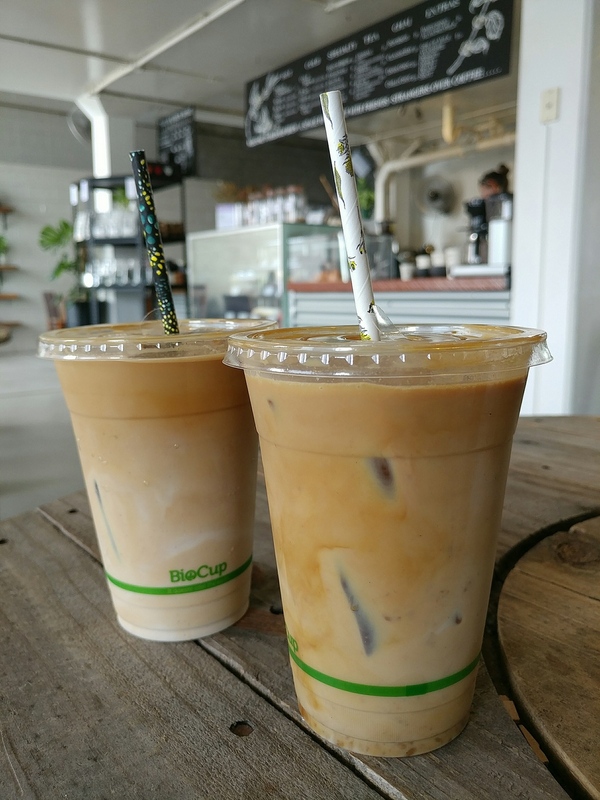 The soy iced lattes were first to arrive. We had them with an extra shot each (the extra shot is complimentary at Freja’s! ), but perhaps we should have tested them at regular strength first. They were certainly strong with the extra shot. Not bitter or sour, but definitely strong. They were nicely cold. 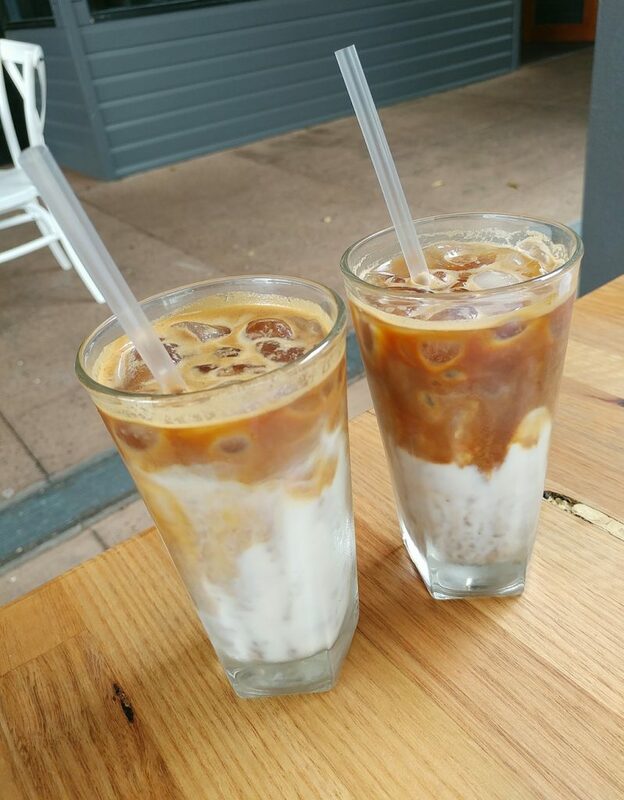 The iced lattes, with an extra shot each. 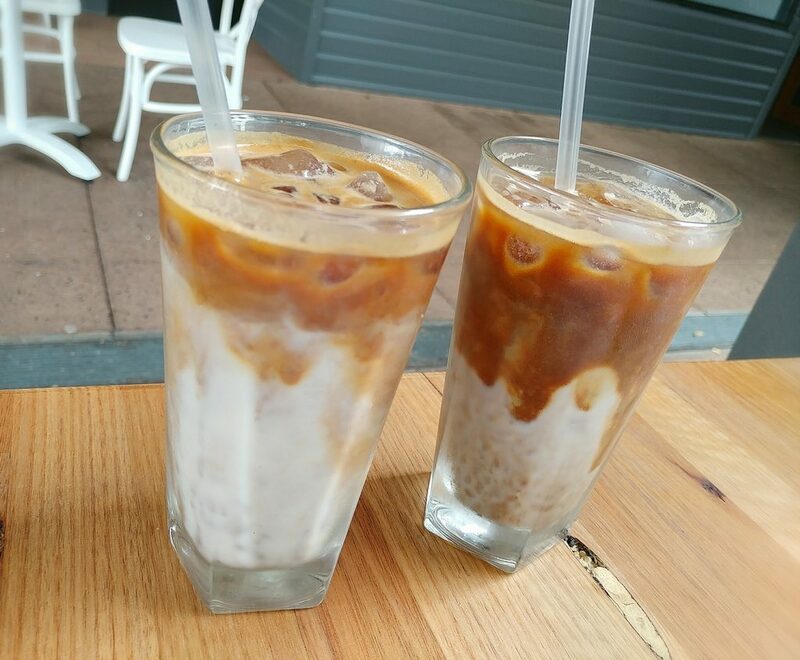 The iced lattes again, before being mixed. 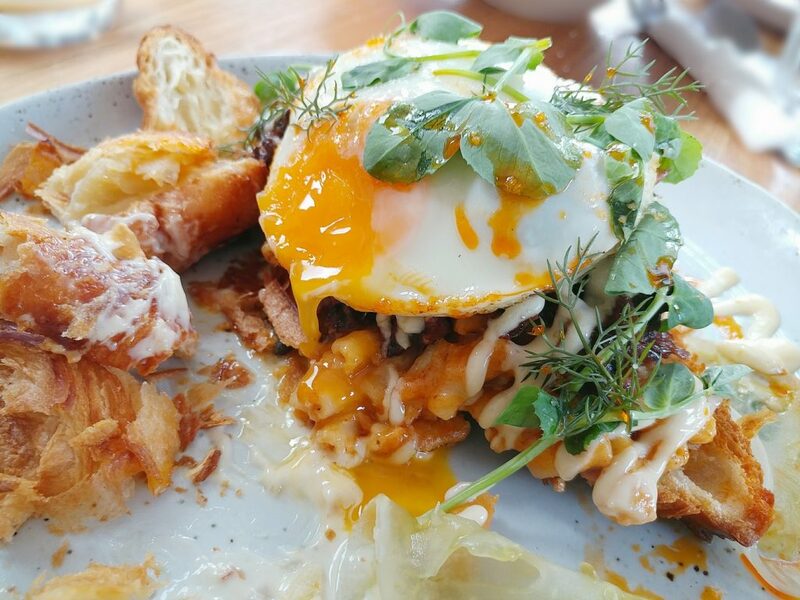 First to arrive was the Croissant with pulled beef cheek, macaroni, fried egg, green tomato, and lime aioli. 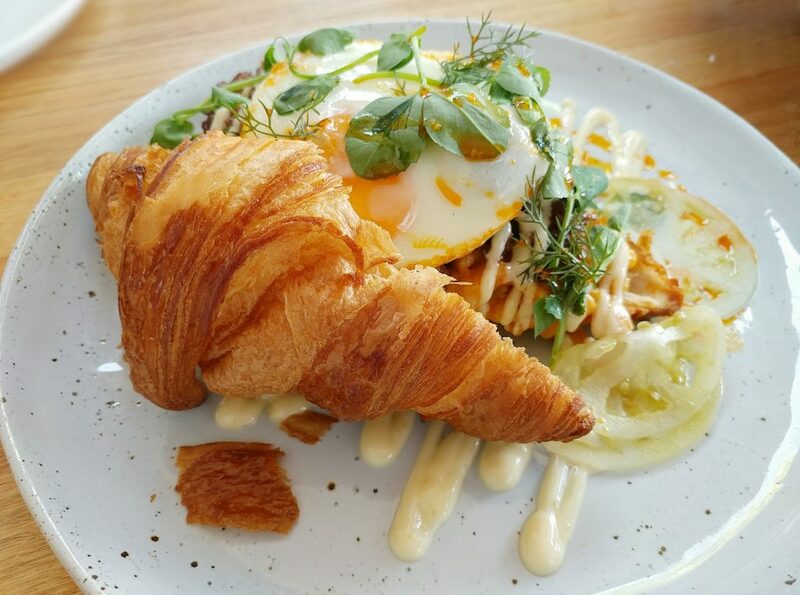 The croissant had a light, layered crispness, rather than a hard crunch. It was beautifully flaky. The macaroni and cheese mix in it was cheesy, creamy, and gooey, just what one wants from mac and cheese. The pulled beef was not stringy at all, but tender, and had meaty red wine flavours. The fried egg was done with a runny yolk and white that was jelly-like rather than rubbery. 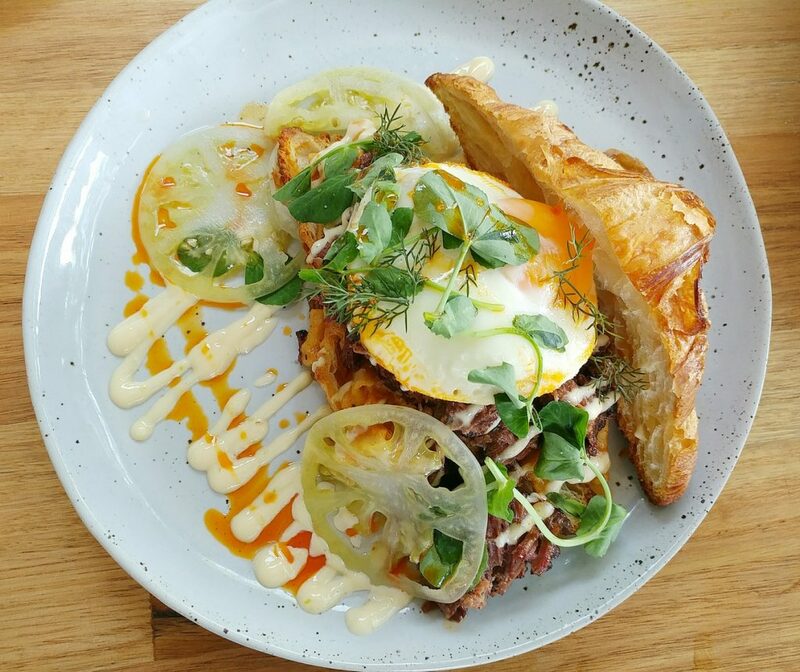 The lime aioli added a brighter flavour that tempered the richness of the other components. The dill garnishing gave it other higher notes. All together, it was indulgent junk food made fancy. 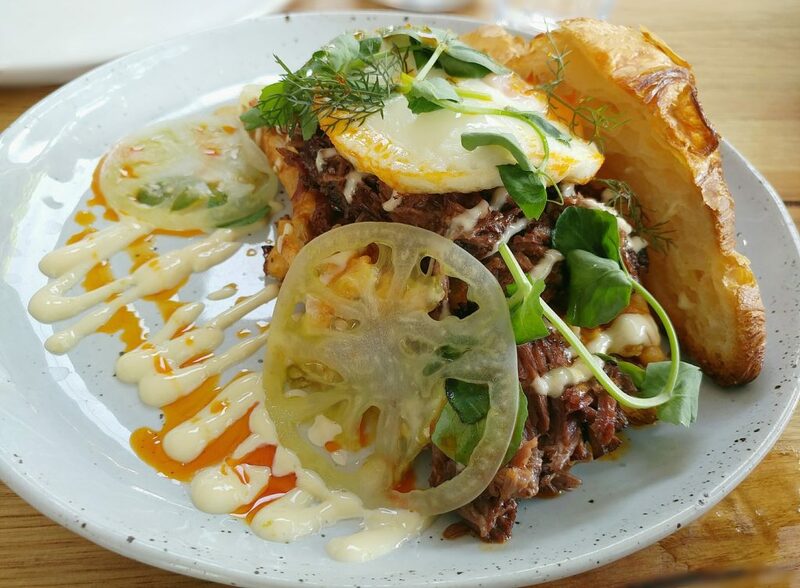 The croissant with pulled beef cheek, macaroni and cheese, fried egg, green tomato, and lime aioli. 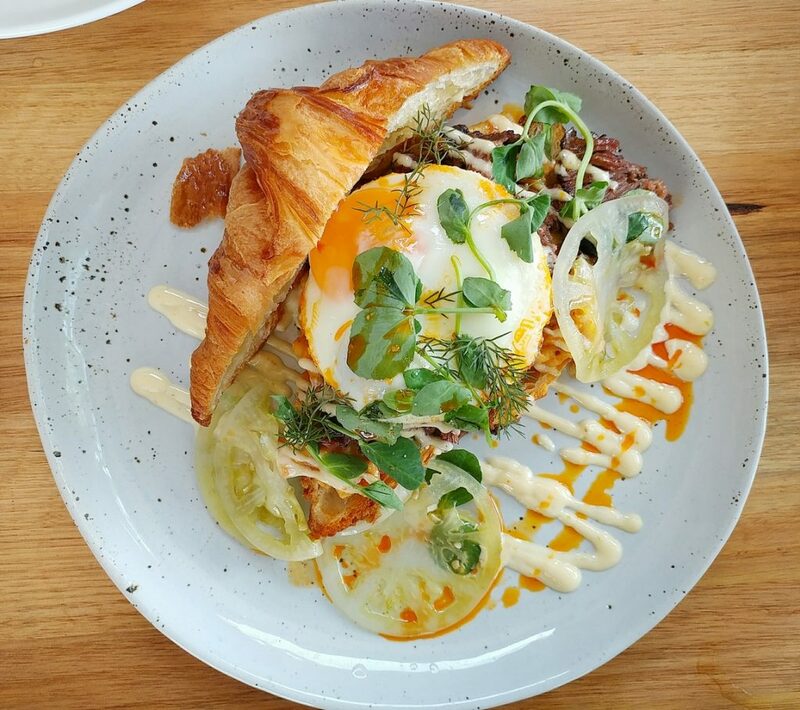 The croissant dish from another angle. A better view of the croissant, with its flaky layers. And so you can see the pulled beef and other fillings better. The other dishes soon followed, effectively arriving together. 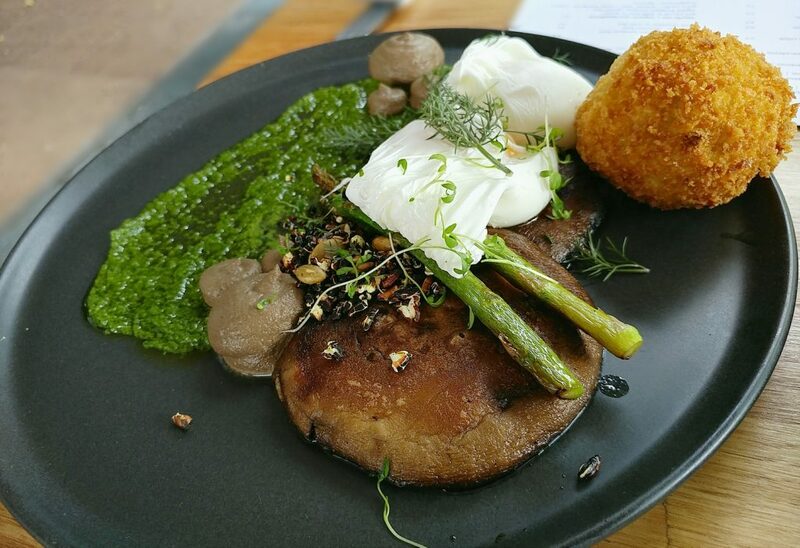 The Field mushroom, potato rosti, grilled asparagus, poached egg, wild rice crumble, and pesto had a very cheffy presentation, the components laid out on the dark plate, reminiscent of a countryside scene, the pesto like the surface of a pond, blobs of mushroom puree in different sizes like boulders to the side of it. 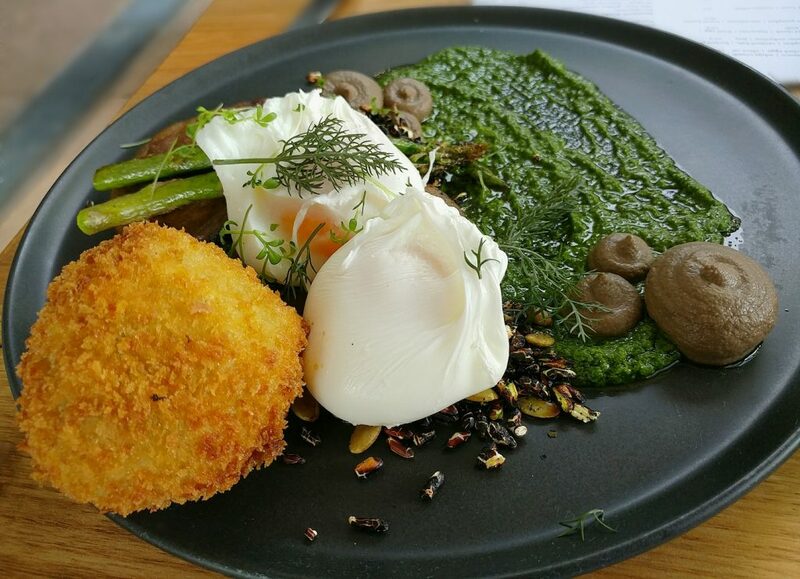 Instead of the flat potato rosti we expected, there was something much more like an arancini ball. It was crunchy outside, with a panko-like crumb. The rice inside was stuck together, but not really cheesy or gooey. The field mushrooms were cooked so they had that meaty, but still juicy texture. They kept their own natural flavour rather than being additionally seasoned. That mushroom puree, however, was concentrated flavour. 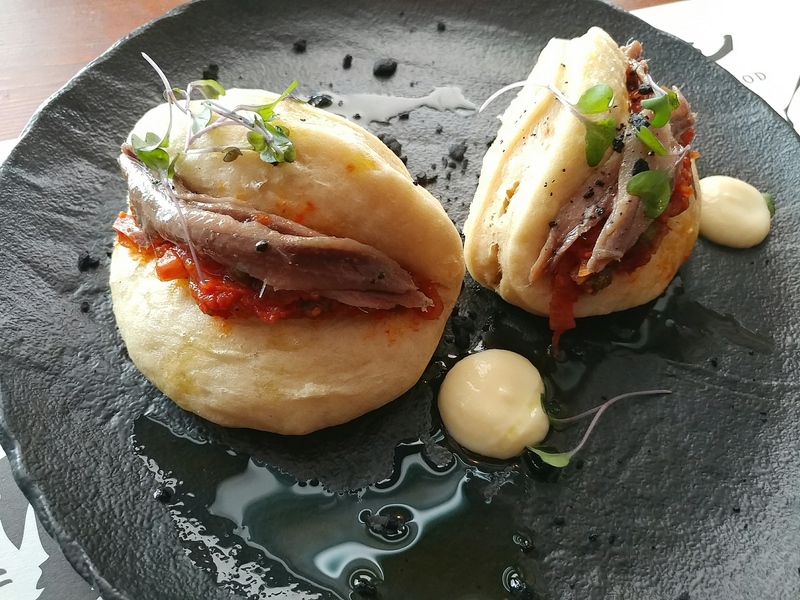 It was savoury, sweet, umami, a little garlicky.. It was the star of the dish, and added to any of the other components, made them more delicious. The wild rice crumble, with its toasted puffed rice added a light, brittle crunchiness, and roasted notes. 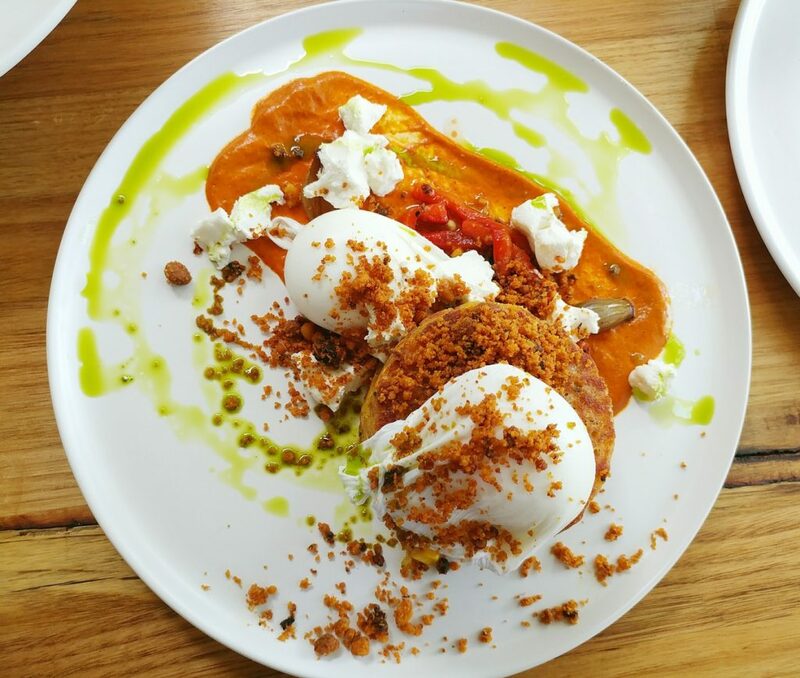 The pesto had a fresh herbiness, and the soft poached eggs had runny yolks. 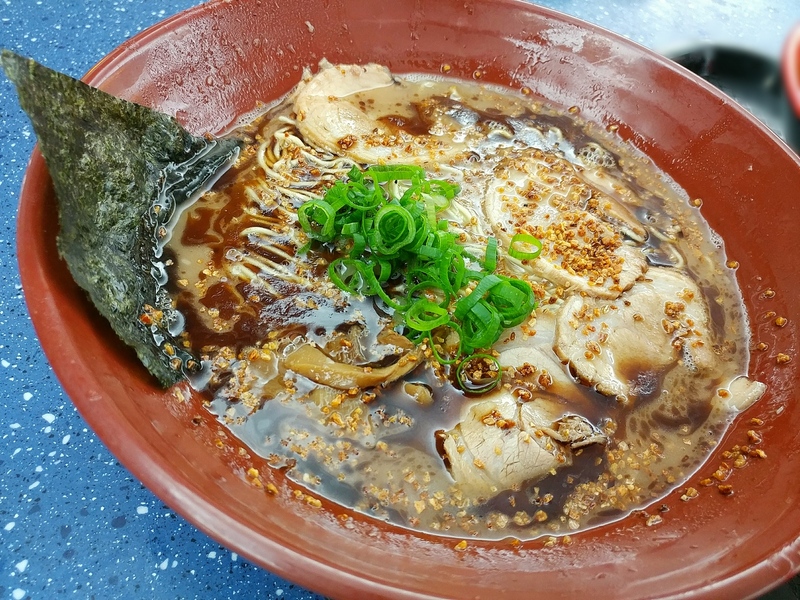 It was a tasty dish, with a variety of textures. 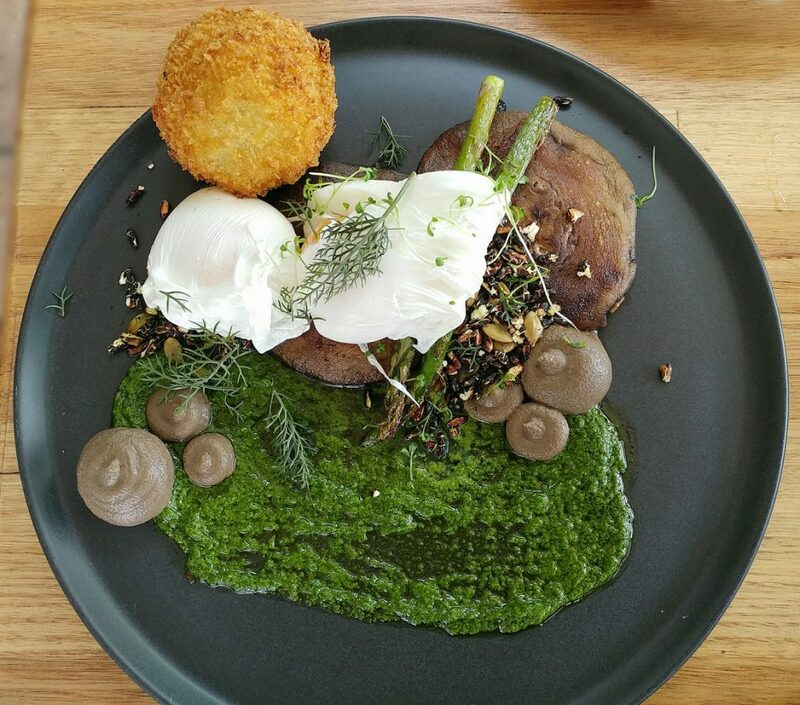 The field mushrooms with potato rosti, grilled asparagus, poached egg, wild rice crumble, and pesto. From another angle so you can see the crumb and other components. The mushroom dish from above, for a better view of the plating. 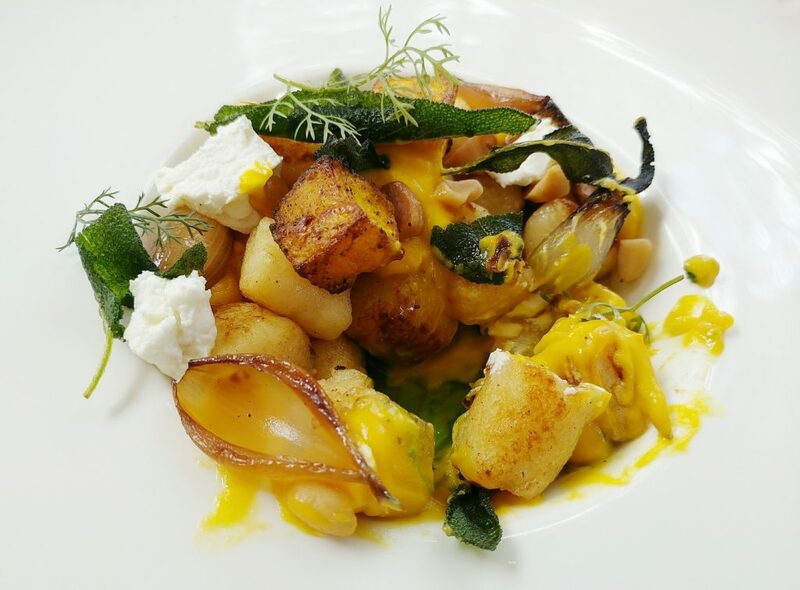 We also had the Sage gnocchi, roast pumpkin, macadamia, burnt butter, and charred onion, which was presented in the central well of a broad-brimmed white dish. On first look, it doesn’t look like much of a serve, but there is more than just what you see on the surface. The gnocchi were fluffy, and exactly the pillowy dumplings you hope for when you order them. There were roasted pumpkin cubes and a pumpkin puree. 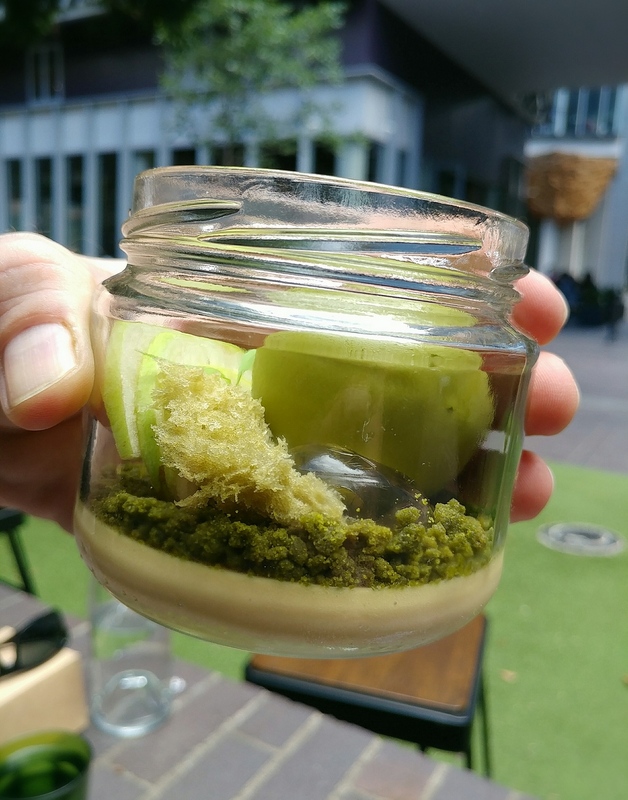 The puree was smooth, creamy, and a balance of sweet and savoury flavours. 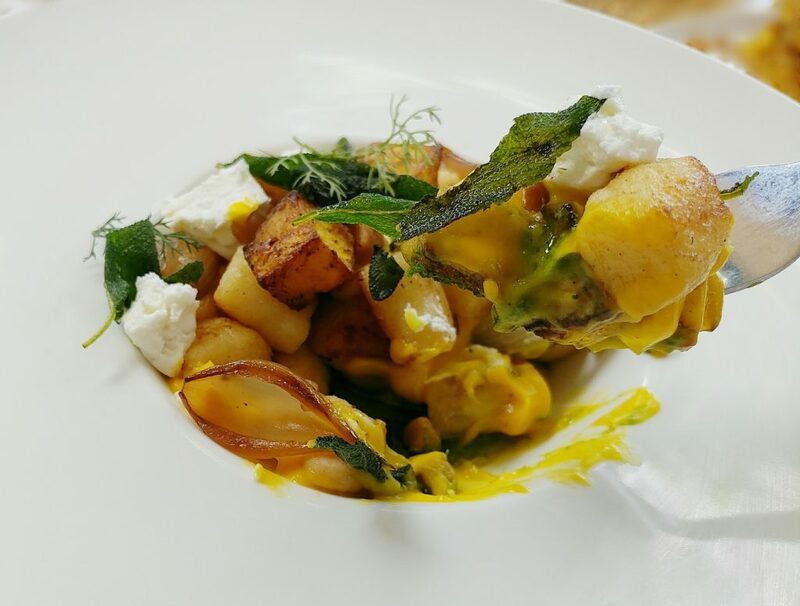 The roasted pumpkin cubes were tender, with burnished edges adding a different texture and toasty note. There were pieces of goat’s cheese in the mix as well, smooth and while not too gamey, contributed a bit of funky flavour. 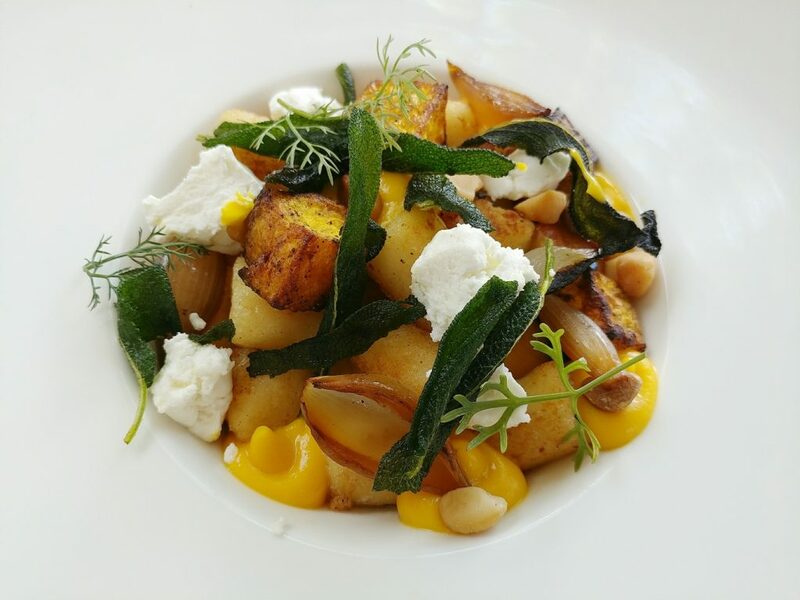 The macadamia pieces gave the dish crunch. 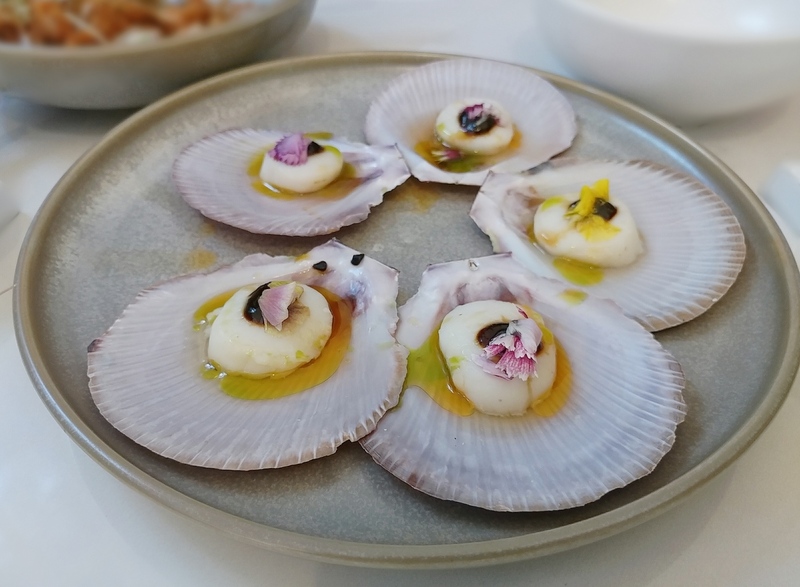 There were charred caramelised onion scales that were pleasantly sweet. It was, again, a combination that gave you good variance with each mouthful. 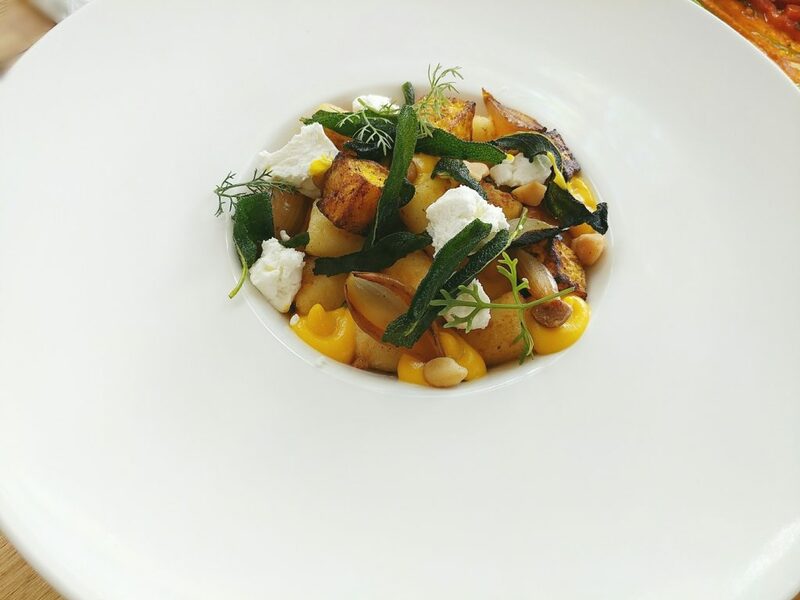 The sage gnocchi, roast pumpkin, macadamia, burnt butter, and charred onion, sitting in the dish. A better view of the dish. The layering in the bowl. 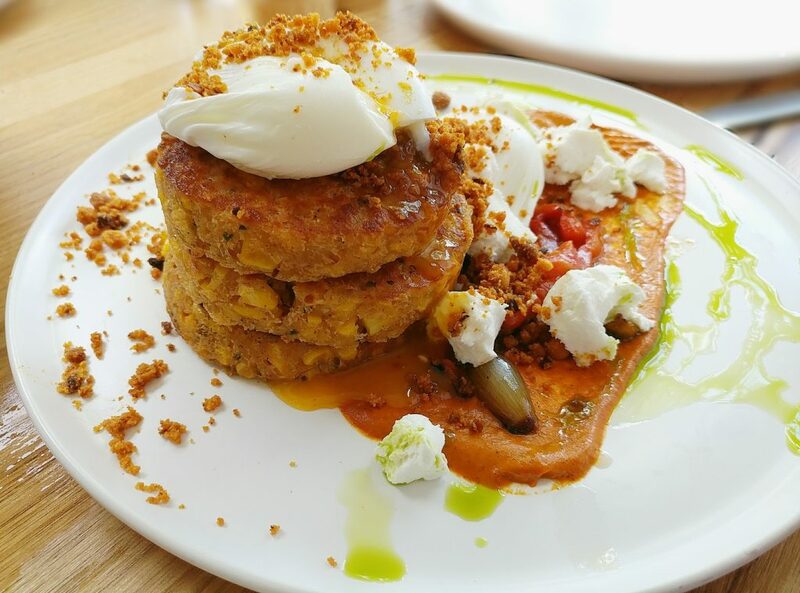 The Corn fritters also sounded too good to go past, with spiced romesco, nduja crumb, charred onion, goat’s feta, poached eggs, and chive oil. They came out as an impressive stack, already better in presentation than the flat pancake-like things that many places call corn fritters. They had good height, and were light and fluffy while still being substantial enough to make for a good, filling brunch. 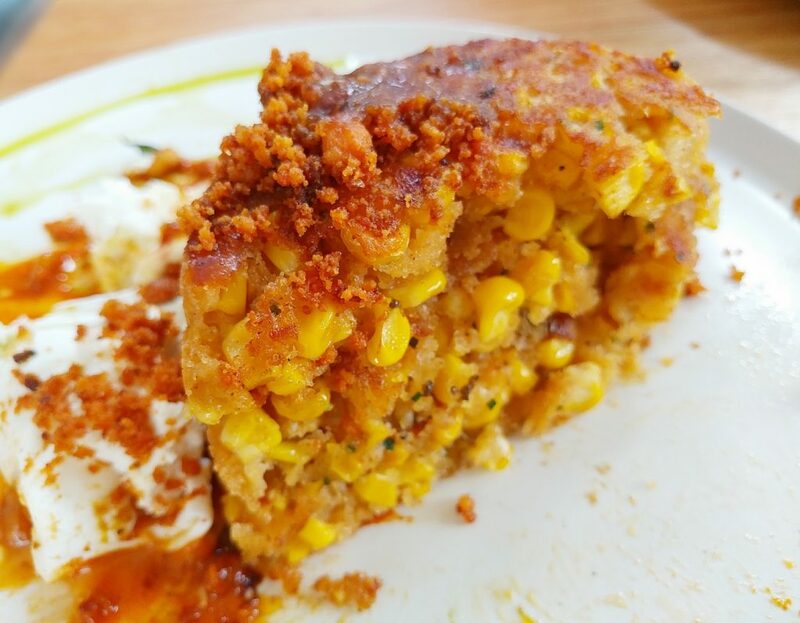 They were not bready or doughy, but quite cake-like, with a generous distribution of corn kernals, which gave crunchy little pops of sweetness with each mouthful. The romesco sauce was tomatoey, and a little tangy, but not spicy. The biscuity nduja crumb on top though, had little sparks of spiciness, and a buttery flavour almost like shortbread. The goat’s cheese was again creamy and had that measuredly funky flavour. The poached eggs had runny yolks, of course. These were decidedly some of the best corn fritters we had had. 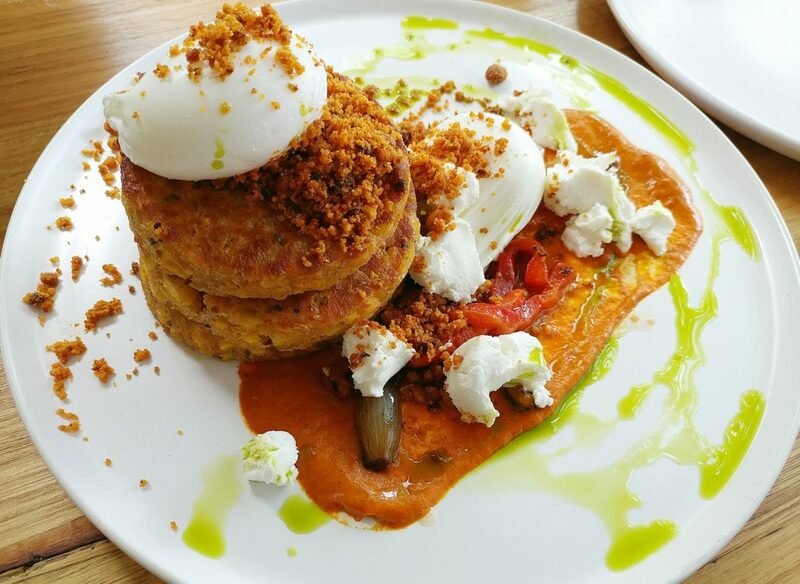 Corn fritters, spiced romesco, nduja crumb, charred onion, goat’s feta, poached eggs, and chive oil. Another view to give you an idea of the height. An overview of the plating. The corn fritters did indeed have plenty of corn. 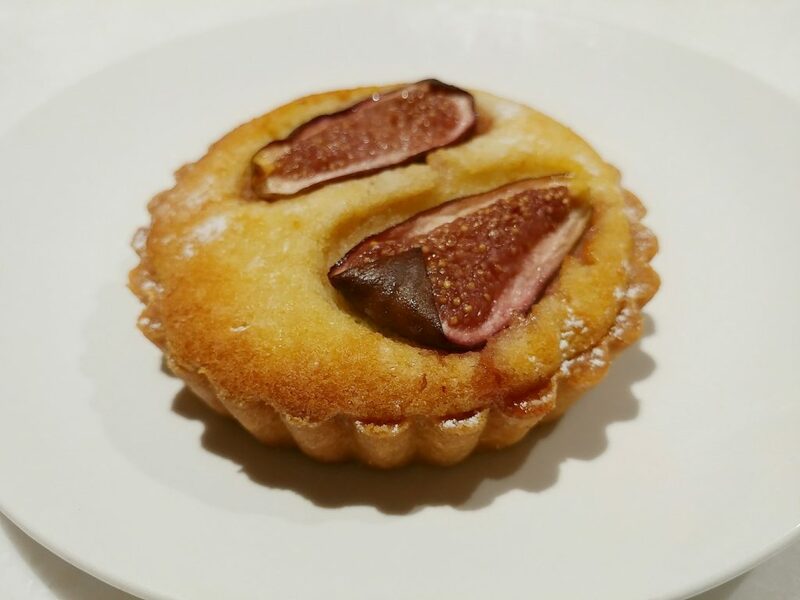 As we left, we revisited what was left in the pastry cabinet (now consolidated on a tray on the counter), and decided to get a fig frangipane tart for the road. This turned out to have subtle flavours rather than being too sweetened. The almond filling that made up most of the tart content was densely packed, but not too heavy. The tart casing was denser than your typical butter shortbread pastry, and less crumbly. The main sweetness in this came from the fig pieces, which were again, reliant on their own natural flavours. If you have a sweet tooth, this might not give you the sugar hit you crave, but if you are after a more balanced treat that doesn’t make you feel guilty, this might work. The pastries that were left..
And the fig tart we wound up getting. Staff were friendly, and preemptively brought out plates for us to be able to share the food after we told them what we intended to do. Overall, we enjoyed all the dishes we had at Freja’s Cafe. Clearly a lot of consideration had gone into the preparation and the presentation, and the items were all well-executed. Certainly a place worth re-visiting. Price point: $13.90 to $20 for things more substantial than toast and spreads.